Hailed as one of the most talented and prolific directors of his generation, it is deeply satisfying to see how Ben Wheatley manages to come up with the goods year after year. Fans and critics alike can breathe a sigh of relief to discover that his latest offering is every bit as exhilarating as his earlier work. After a brief absence during the making of his critically acclaimed adaptation of J.G Ballard’s High-Rise, Wheatley is back to his rightful home at Rook Films with the excellent Free Fire. The film not only features a stellar cast and a brilliantly engaging screenplay, but as a bonus has Martin Scorsese as executive producer. Set in Massachusetts in the late ‘70s, Free Fire pays homage to countless classic shootout movies, especially those made by legendary Hollywood director Sam Peckinpah at the height of his career. Wheatley admits to not only being fascinated by the editing in these classic movies, but also to being motivated by the need to bring more realistic elements into the telling of such stories. Justine (Brie Larson), a savvy underworld go-between, has brokered an arms-deal between two Irishmen, Chris (Cillian Murphy) and Frank (Michael Smiley), and gibbering South African show-off Vernon (Sharlto Copley). Added to the mix is wisecracking know-it-all Ord (Armie Hammer), a bearded Adonis with a penchant for the odd joint or two. As the group is joined by an array of hapless petty criminals on either side, things quickly take a turn for the ridiculous when two rival henchmen discover that they have unresolved issues and start firing at each other. This escalates to a deadly stand-off between warring gangs with neither side willing to back down. Co-written by Ben Wheatley and the excellent Amy Jump, the screenplay offers a brilliantly intricate set of twists and turns – and with more characters than you can shake a stick at, Wheatley and Jump manage the impossible by setting the whole story in one location. Filmed mostly in a warehouse on the outskirts of the director’s hometown of Brighton, Free Fire offers a joyfully quick-witted dialogue performed by a fantastic cast. Michael Smiley excels as the group’s responsible adult exasperated by this merry band of losers and psychopaths. Larson is brilliantly sardonic as the only woman of the group, fending off propositions from gormless charisma-free zone, Vernon. By far the most impressive performance comes from Armie Hammer, who seems to have successfully managed to shake off his Hollywood heart-throb image for a far more nuanced one. 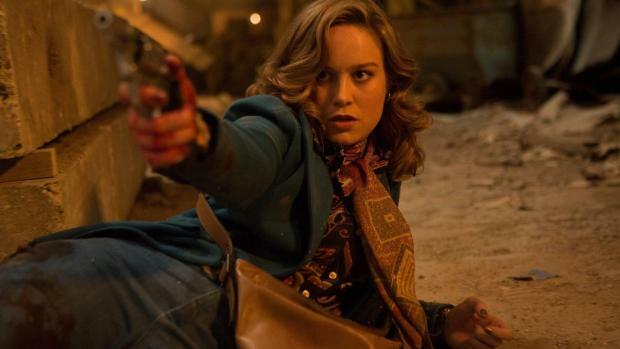 Free Fire may not be to everyone’s liking, and judging by the snobby way in which it was received in some circles, the film may not score high on the worthy indie credentials scale. However, dismissing Wheatley and his huge body of work would be a mistake. With a brilliantly composed script, and impressive cinematography from Laurie Rose, the film is likely to strike a chord not only with Wheatley’s usual demographic, but could also appeal to a growing fanbase of this particular brand of gritty action comedy. Free Fire is a funny, clever and highly entertaining piece of filmmaking, and for that alone, Wheatley deserves every accolade. A must see. Free fire is in cinemas from Friday March 31st.